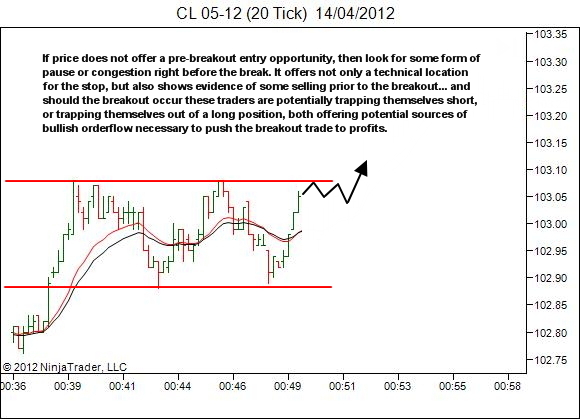 If you've been around my writing for a while you know I'm not a massive fan of breakout entries. But the thing is they can offer great potential if done right. And I know that some of my readers do take them – they tell me. Plus (and we'll keep this between you and me) from time to time one will just be screaming out for me to take it, and I may just do that. If you're going to take breakout entries, I highly recommend you take some time to develop a set of conditions that will help you to enter the lower risk opportunities, and to avoid the higher risk ones. One type I will always avoid is demonstrated below. Here we have a breakout in which the price swing prior to the break has travelled a significant distance already, without any pullback or pause for congestion. My main problem with this is management of risk. Where are you going to put the stop? It's quite reasonable after such an extended run to expect some profit taking. And that, combined with any other short entry orderflow attempting to capture a breakout failure, may just be sufficient to drive price back below the breakout level. Where will you put your stop? Maybe just below the breakout bar? That's not too bad from a "minimising risk" perspective, but from a technical perspective it's not the greatest. You'll have low risk, at the cost of greater stop outs. The only reasonable "technical" stop is the opposite side of the rectangle pattern, which is not good at all from a risk:reward perspective. 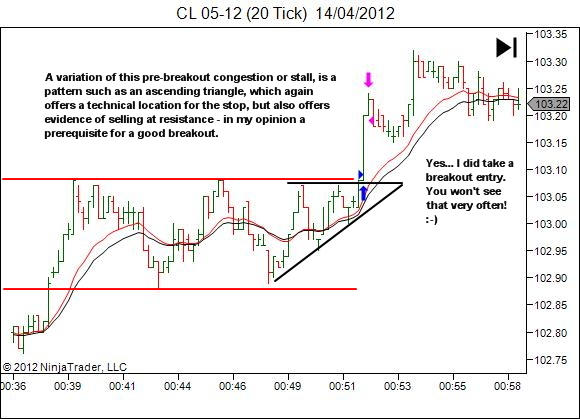 Take them if you wish… but I prefer to avoid any breakout which occurs late in an extended price move. So let's look at some entry options which I would be happy to take. 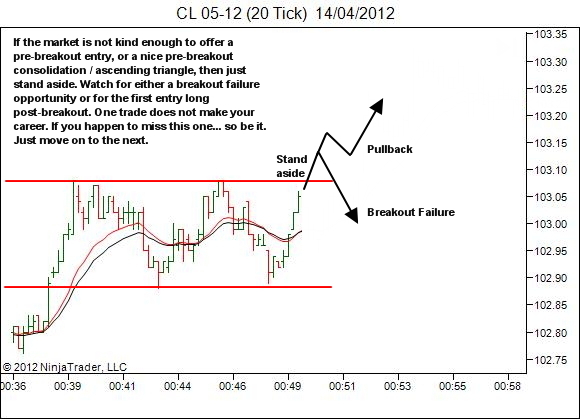 First, why not try for an entry pre-breakout if it becomes available. 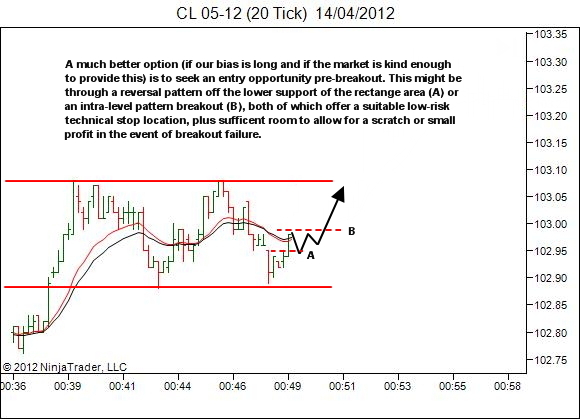 If your bias is for continuation long, watch for a pattern based entry in that direction prior to the breakout. 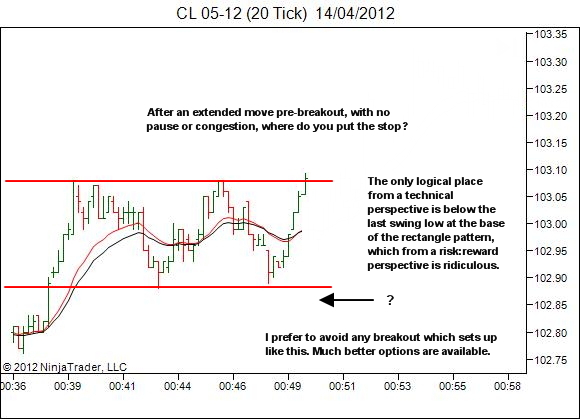 If that is not available, consider a breakout entry only when price offers offers a period of congestion prior to the break. But if the market does not offer an entry pre-breakout, and does not offer some form of pause or building of pressure prior to the break, but rather just extends a great distance prior to the break, what options are there? As I said earlier, take them if you wish, but you'll be doing so without me. In fact I'll be watching closely to profit from the failure of the move. But should it travel on without me, then I'll be seeking opportunity on either the first pullback after the breakout, or the first period of post-breakout stall.